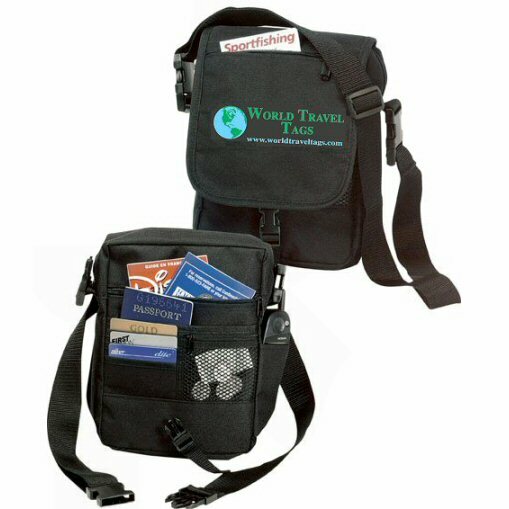 World Travel Tags offers a variety of document holders for your travel needs. 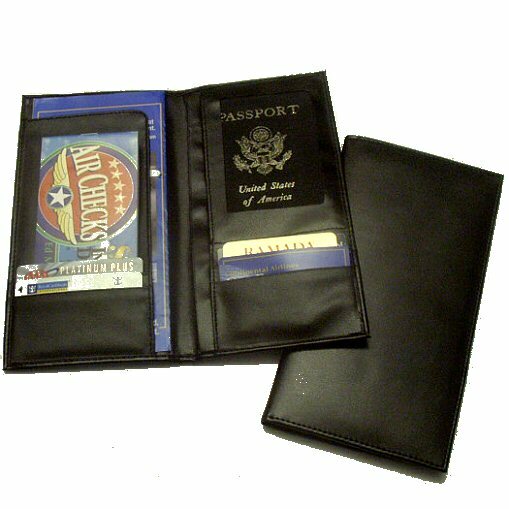 Ideal for keeping tickets, passports, credit cards, checks, cash and any important papers safe and organized while traveling – whether as an individual or as part of a group. 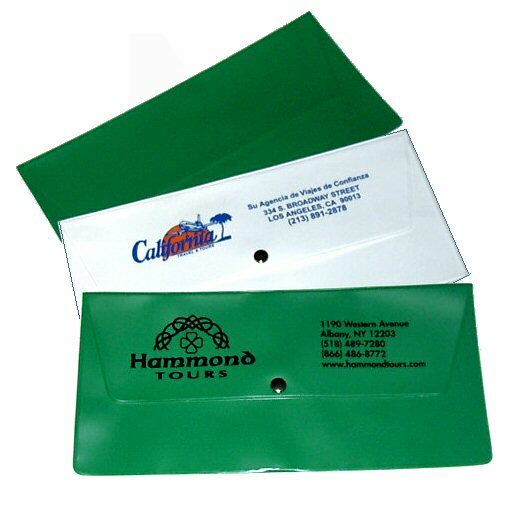 Since several options are available for these document holders, please contact us with your specific needs so we can give you accurate pricing and production information. Several examples are shown below. Click on the small images to see a larger photo in a new tab. 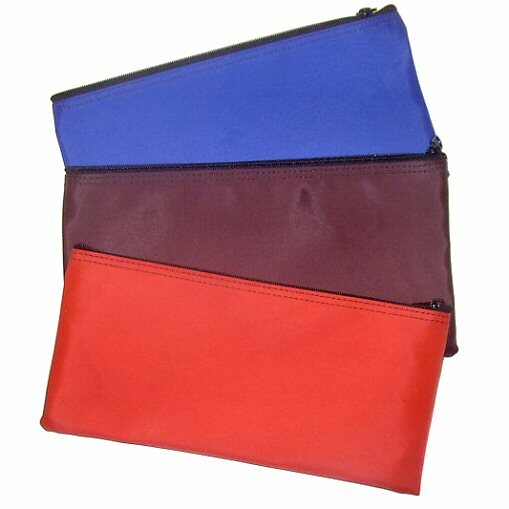 A single compartment flapped pouch with a snap closure made of 12 mil vinyl available in 18 colors. 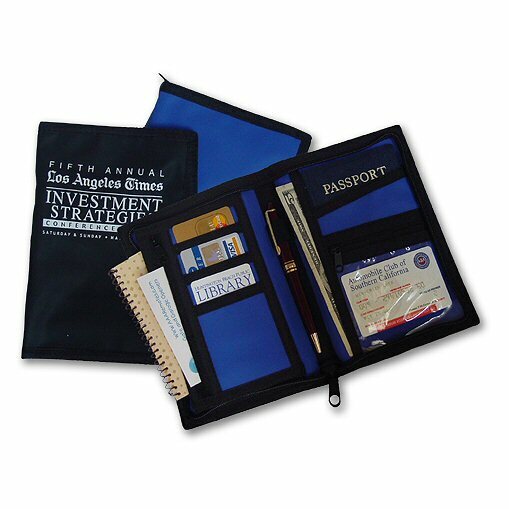 This is an economical pouch ideal for all types of travel documents. A single compartment top zippered pouch made of durable 70 denier nylon with a polyvinyl lining. This PV lining makes the nylon water resistant. Available in 19 nylon colors with 16 imprint colors. A black zipper is standard. Colored zippers available at additional cost. Measurements: 10-1/2 inches by 5 inches or 11 inches by 6 inches. 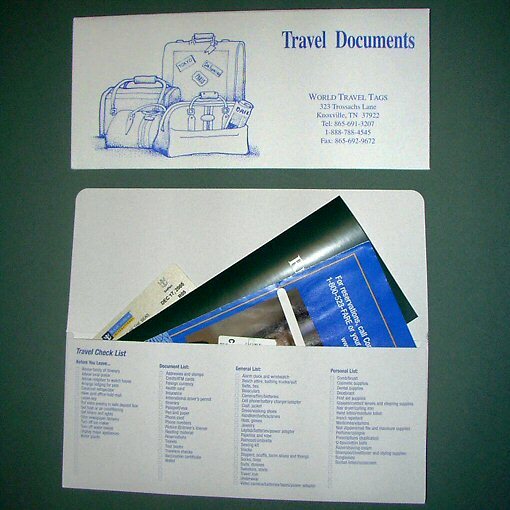 Soft Touch Vinyl with nylon trim. 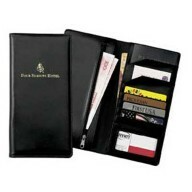 Outside pocket, four inside pockets, pen loop, six card pockets, business card pocket. 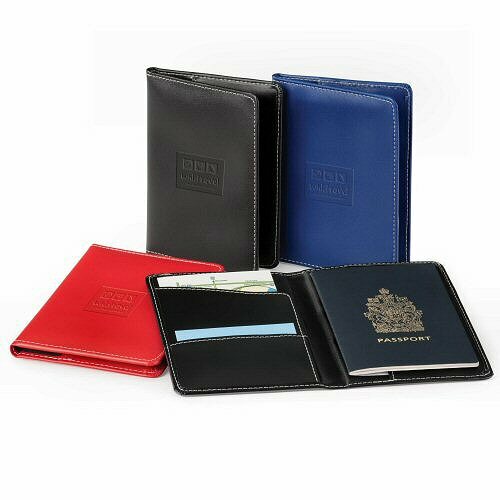 Available in Gray and Royal Blue – both with black trim. Measurements: 9-3/4 inches by 5 inches (folded). Polytex ( polypropylene ) with polyester trim. 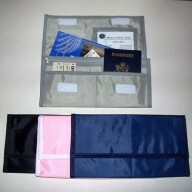 4 inside pockets – fits passport, 6 card pockets, see thru mesh business card / ID pocket. Measurements: 9-5/8 inches by 5-1/4 inches (folded). Made of 70 Denier Nylon. 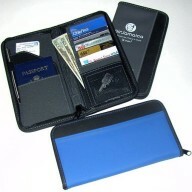 Multiple pockets, slots, and zippered compartments ideal for credit cards, ID’s, passports etc. Pen holder. Large interior flap pocket for airline tickets and boarding passes, mesh window pocket for passport or ID, 4 credit card slots, 2 hidden pockets for currency, checks and travel documents. Secure zipper compartment, 2 file compartments, 2 passport pockets, 5 card pockets. A soft vinyl wallet with the look and feel of leather. Full size exterior pocket. Checks/currency pocket. Snap closure on inside privacy pocket. 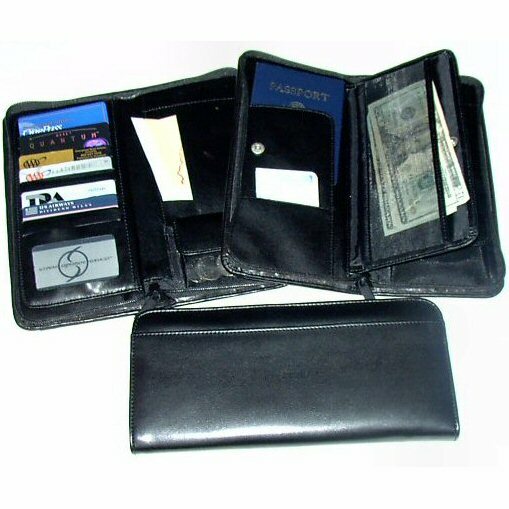 Nine card slots. Two vertical passport pockets. Imprinting available. Measurements: 10-1/8 inches by 5 inches (folded). 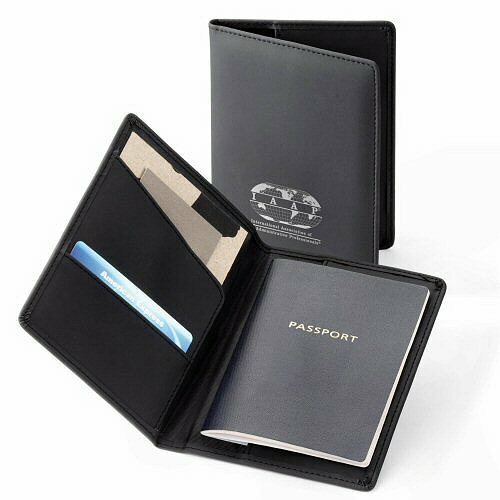 Made of 600 denier polyester, zipper on top, front zipper pocket, back open pocket, card holders, zippered mesh pocket, zipper pocket on flap, strap can be used for carrying pouch on shoulder or waist. Dimensions: 7-1/2 inches wide by 10 inches high by 2 inches deep. Single flapped document holder constructed of very durable 80 lb. card stock. Available in many colors and finishes. Standard or custom design. Very economical. Large pocket, zippered pocket, 2 small pockets. 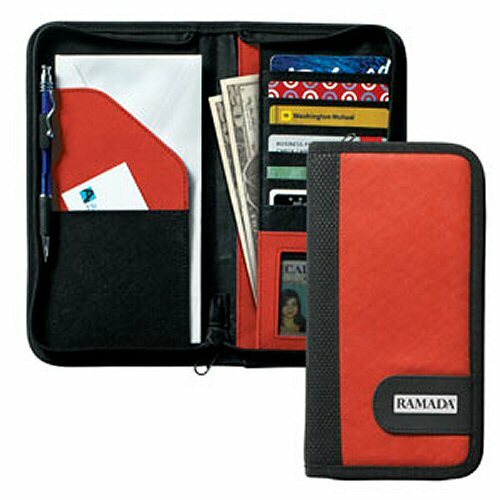 Ideal for travel documents, boarding passes, currency, passports, credit cards, ID’s etc. Velcro closure. 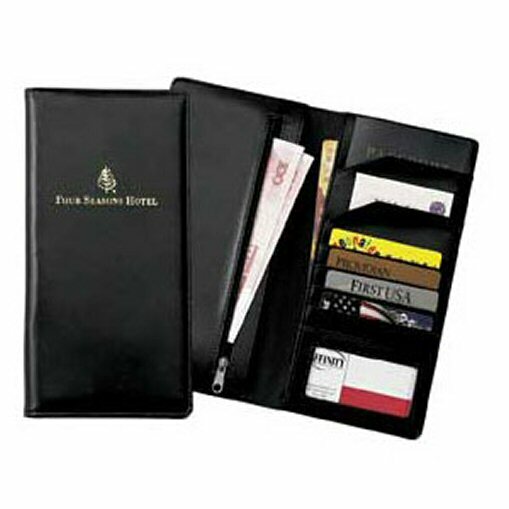 Vinyl passport holder with a decorative white stitching, nylon lining, interior pockets and card holder. Passport Holder with 2 interior pockets, nylon lining and an interior card slot.